Silke Stein is a graphic designer and the author of the middle-grade novels 'Trina Bell's Humming Summer' and 'Sleep, Merel, Sleep', and the upcoming women's fiction release 'Foam on the Crest of Waves'. Silke currently lives at the west coast of Canada, where she combs the shores of the Pacific Ocean and tends to her ever-growing sea glass collection. When she is not at the beach, or writing, or helping her husband playtest his latest board game invention, she designs book covers for fellow authors. 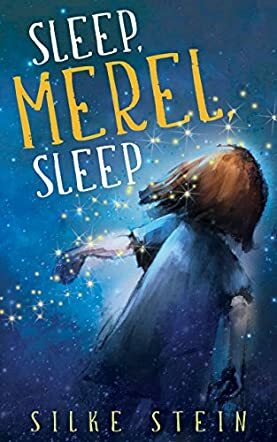 Sleep, Merel, Sleep by Silke Stein is a children’s fantasy story about a girl named Merel who has to make things right after her bratty behavior sends her personal “Sleep” friend away in a huff. Merel is always angry and upset these days because her infant brother is extremely ill and her parents don’t have time for her. Merel sees things darkly. She doesn’t want to sleep or relax, but to cry, and storm, and throw things. When her Sleep gives up on her, snotty, rude Merel is sent through a surreal fantasy land in a desperate effort to locate him. Until he does, she will never sleep again. Exhausted, Merel drifts from one obstacle to another, each one reminding her of something in her life, as the elusive Lullabye Grove seems always out of reach. Sleep, Merel, Sleep is an astonishing story that shines with a glowing honesty. Both the writing and imaginative angles are excellent. Silke Stein weaves a sheer, gauzy blend of both into a world that’s half-Oz, half-Wonderland, and doesn’t have one word out of place. Each aspect of Merel’s journey springs on her in a marvelous, sudden way that seems irrational but operates with the deep logic of a living dream as Merel pieces together her own weaknesses and slowly understands the wrong in her ways, one step at a time. Pursued by a ghostly man with bloodshot eyes, determined to eradicate sleep, Merel learns about the folly of self-pity, the kind heart beneath her mother’s busy exterior, and—the biggest surprise of all—just how Merel really feels towards her baby brother. A delicately symbolic tale that made me care about this little girl every step of the way as she learns to accept her family and her place in it.